At least 13 incumbent local government leaders in South Cotabato and Sarangani remain loyal to Lakas-Kampi-CMD standard-bearer Gilberto “Gibo” Teodoro. Representative Arthur Pingoy Jr. of the second district of South Cotabato, said pro-Gibo officials are exerting extra effort to secure the former defense secretary’s win in these provinces that have long been a turf of the opposition party. “Out of the seven incumbent mayors in my district, six are doing their best efforts to ensure that Gibo will be victorious in their municipalities,” said Pingoy, a three-term congressman now seeking the gubernatorial post. 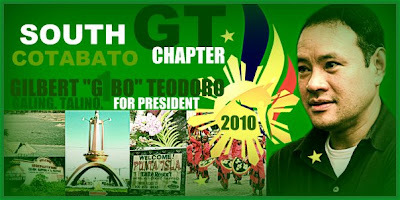 He identified some of the incumbent mayors solid for Teodoro as Antonio Damandaman (Sto. Nino), Isidro Janita (Banga), Romeo Januto (Norala), Salvador Lagos (Tantangan), Basilio Salif (Lake Sebu) and Romulo Solivio (Surallah).